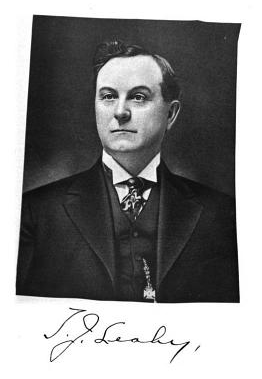 Timothy Leahy was a brother of M. D. (Maurice) Leahy who founded and was president of the Freethought University at Liberal, Missouri. The University was founded when Leahy was but about 21 years of age and lasted for two years, dissolving due to some falling out with George Walser, and subsequently being unable to maintain a presence due to financial hardship. I post the following biography on Timothy Leahy, published in the Standard History of Oklahoma in 1916, as it will reveal a little more of something of Leahy’s family in addition to what Timothy had written to the Freethought publication Blade of Grass, on his then deceased brother, in September of 1909. Hon. T. J. Leahy is widely known as a man of high attainments, of profound erudition and practical ability as a lawyer, and as one who has achieved success in his profession. He is one of the most interesting of the prominent characters whose worth and merit have graced the history of Oklahoma as a state and territory, and was one of the two members elected to the Constitutional Convention from the Fifty-sixth District. In that high position he performed particularly notable work as a member of the Committee on Public Service Corporations, as such, making a thorough study and unprejudiced investigation of the great problems in connection with the governmental regulation of public service corporations, giving his best thought and judgment in an effort to arrive at a just solution of this modern and somewhat complex phase of legislation. The constitutional provisions result of this committee’s work in the convention are conceded to be of the greatest beneficence to the state. Mr. Leahy is one of the strong leaders of the bar in Oklahoma. For several years he conducted a large criminal practice, which is still a feature of his legal business, having an established reputation for success in, that line. His practice as a whole, however, is of a general nature, extending into several states in addition to the Oklahoma State and Federal courts and the Interior Department. He was chairman of the commission that investigated the status and value of the segregated coal and other mineral lands of the Indian Territory and made recommendations as to the advisability of having the state purchase those lands. He spent much time and labor on the work of this commission, the report of which was submitted to the governor of Oklahoma in 1908. Mr. Leahy was also father of the measure, which was made a part of the Bill of Rights, providing that the right of the state to enter into public enterprise for public purposes should uot be denied. The labor unions and laboring element generally were particularly pleased with Mr. Leahy’s championship of measures in their interest in the Constitutional Convention. He is democratic in politics. Mr. Leahy is a member of a family well known in the Osage Nation for many years back, and his cousin, W. T. Leahy, and uncle, Thomas Leahy, stockmen and bankers and residents of Pawhuska, have been prominently identified with various interests in this country since the early eighties. But the Hon. T. J. Leahy is a native son of Kansas, born in Neosho County, in 1868, his parents born natives of Ireland, being early settlers in that state. His father died in 1869, but his mother is still living. Her home is in Pawhuska., Mr. Leahy was reared in Neosho County, Kansas, receiving a common school and normal education. He studied law in both Kansas and Oklahoma and was admitted to the bar in 1892. In that year he settled permanently in Pawhuska, the capital of the Osage Nation, although he had been in the Nation back and forth since 1884. He belongs to the Masonic Order, and also the Knights of Pythias, of which latter he is past grand chancellor of Oklahoma. Mr. Leahy married in Pawhuska, Miss Bertha Rogers, who was born and reared there, a member of an old family of part Osage Indian blood, and daughter of Hon. Thomas L. Rogers, whose sketch is found in another page of this volume. Mr. and Mrs. Leahy have four children: Thomas Rogers, Cora Willella, Mabel Ann and Edward Arthur. I am related to the Osage Rogers family, Thomas Lewis Rogers, Sr. is my gggrand father. Always looking for more information on this line of my family. I am trying to find out where in Kansas this family was located, I think my ggrandfather died in Kansas and then his twin brother married his widow. Any help is appreciated. Thomas Rogers, SR, was also my Great Great Grandfather. He and Ellen Lombard Rogers had a daughter named Elmira Rogers. She married my Great Grandfather, Thomas P. Rodman. The had one child named Antwine Rodman. Antwine was my Grandfather. One of his sons, Wilbur C. Rodman was my father. I am Thomas Mark Rodman. My link isn’t descendancy. A niece of an ancestor of mine married Antwine Rodman, a grandson of Thomas Lewis Rogers Sr. The people in my family associated with this family lived in the Chautauqua County, Kansas and neighboring Osage Reserve/County, Oklahoma area–and I think much of the family lived there at the time. Joseph Rogers I have as dying about 1876 and that he was buried at Lombard Cemetery in Skiatook in Osage, OK. I don’t recollect where I got that data and didn’t note it. Antoine, who did marry Joseph’s widow, Elizabeth Carpenter, lived with her on the Osage Reserve in Oklahoma. The census has them there in 1900, and then in 1910 and 1920 they are specifically given as being in Strike Axe, Osage, Oklahoma. But “The Osage, An Imperious Ancestry” gives Antoine as dying in 1921 in Wynona, Osage, Oklahoma. He and Elizabeth are buried at the Pawhuska City Cemetery. If they were in Kansas for any period of time, the easiest speculation would be somewhere in Chautauqua County. A fair number of Osage lived there. Oh, wait, as far as Joseph Rogers, he would likely have been up in the Neosho County Kansas area, that’s where the Osage Agency was. In 1871-1872 they moved to Oklahoma. OK, I checked Jasper and Mary Minerva’s birthplaces and “Imperious” gives them as born in “Grand River”. “A Standard History of Oklahoma” by Joseph Bradfield Thoburn speaks about the establishment of a trading post in the valley of the Grand River, in Mayes county, on the present site of the town of Salina. Thanks so much for your help. I know exactly where the Lombard Cemetery is located. Elizbeth Carpenter’s parents were suppose to be from Skiatook, but I don’t know anymore information then that. John Rogers had a saltworks in the Salina area. Again thank for the help. Stacy, Have you been to the Lombard Cemetery? I have been once and plan to go again soon. I think we may have communicated before…I just don’t remember. I am searching, in vain, for any information regarding my Great Grandmother, Elmira Rogers Rodman. I have her marriage certificate to my Great Grandfather, Thomas P. Rodman. I don’t have a firm birthday for her. I’m hoping I will find her buried in that Lombard Cemetery when I go back again. I found her mother, Ellen Lombard Rogers there. Please let me know if you have any information regarding Elmira Rogers Rodman. thanks. I have Jasper Rogers birth place in Saline District.